Perfect balance between amethyst, tourmaline, and ochre! Originally developed for NASA, the space age memory foam conforms to your head and neck to ensure an anatomically supportive sleep posture. It also features a therapeutic shape to provide additional support for your neck while comfortably cradling your head. 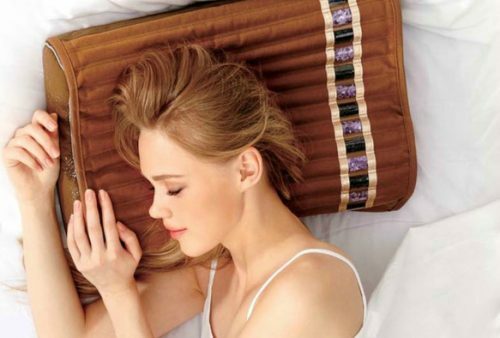 As an added touch, a luxurious zippered cover featuring alternating rows of amethyst and tourmaline lines the memory foam aiding in a restful sleep. 3D surface removal production technology prevents the product from yellowing. The combination of ochre and negative ions works for antimicrobial action and the removal of bad odors. The pillow’s ergonomic design reflects the best possible sleep science. These products are not intended to diagnose, treat, cure or prevent any disease. Specific medical advice should be obtained from a licensed health care practitioner.